We are a prominent Manufacturer, Supplier and Exporter of Die Punching & Creasing Machine. The Die Punching & Creasing Machine is specially designed for heavy jobs of cutting, creasing & embossing of Card Board, Corrugated board, Plastic & PVC materials etc. 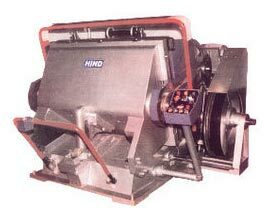 Owing to their qualitative features, these Die Punching & Creasing Machines are highly demanded by various paper mills, etc.